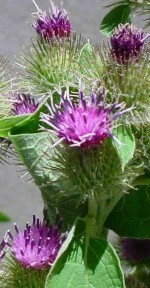 Take a walk with your dog in a place where common burdock grows and you will spend the following half hour pulling the brown burs off your clothing and pet’s fur. Common burdock is so annoying that it is hard to imagine that it has redeeming qualities like being edible, a valuable herb, the source of a fiber used in paper and the inspiration for Velcro. A native or Eurasia, this biennial weed has spread through most of the upper half of the US where it inhabits pastures, hay fields, roadsides, shrub borders and fence rows. It grows in sun or shade and in rich or poor soil. 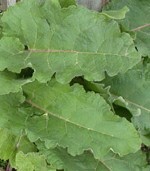 The first year the plant produces a basal rosette of large, coarse, heart-shaped leaves 6”-18” long and 4”-14” wide. The pale green leaves are borne on hallow petioles and their margins are wavy and toothed. The second year, the plant produces an erect branched hallow stem from 1’ to 5’ tall with alternate, relatively small egg-shaped leaves. From mid-summer to fall lavender to purple flowers are produced in clusters of dense heads ¾” wide either at the ends of the branches or in the areas between the stem and leaves. Each flower head is surrounded by bracts that have hooks. Flowers are followed by a small one- seeded dry fruits called achenes that are responsible for the spread of the plant. The root system consists of a long fleshy taproot. Eliminating the first-year rosettes of leaves by hand pulling or hoeing is the best way control this weed. If some seedlings escape and send up flowering shoots, remove the shoot before it forms flowers or seeds. This can be done by mowing. Pulling up a second year plant is difficult because of the long taproot and if any part of the root is left in the soil it will resprout. Since the plant is a biennial, however, a persistent taproot will die of its own accord at the end of the growing season and not cause future problems. Traditional selective and non-selective herbicides such as 2-4 D, picloram, dicamba, or glyphosate.